The Federation of Malaya is now independent. The handover of power from Britain took place at midnight. Thousands of young members of the Malay, Chinese and Indian parties, which form the government, stood in darkness for two minutes at midnight to mark the official handover. As the new flag of independence was raised they called "Merdeka" (freedom) seven times. Tunku Abdul Rahman, the prime minister-elect, who led the negotiations with the British for handover of power, was hailed as the Father of Independence. Malaya will stay in the Commonwealth - and, as midnight approached, prime ministers of the member countries sent messages recorded in five continents. The British Prime Minister Harold Macmillan said he hoped 31 August would long be remembered as a great and happy day in the continuing development of Malaya and the Commonwealth of Nations. In his speech delivered at midnight, Tunku Abdul Rahman said it was the greatest moment in the life of the Malayan people. A new star had risen in the eastern sky - a star of freedom for yet another Asian people. The new prime minister was educated at two British schools and graduated from Cambridge in 1925. Soon after World War II he went back to Britain to study law. On his return to Malaya in 1949 he found a country eager for independence but also struggling with communist extremism. He founded the Alliance Party in 1952 which brought together the ethnic Malay, Chinese and Indians. The party won the 1955 general election with an overwhelming majority. The Tunku became Chief Minister and ended the state of emergency - introduced after a wave of attacks carried out by mainly Chinese communists on mine-owners and plantations - and granted an amnesty to communist terrorists. Last year he led the negotiations with the British which paved the way for independence. The new Malayan head of state, Tuanku Abdul Rahman, will be officially installed on 2 September. 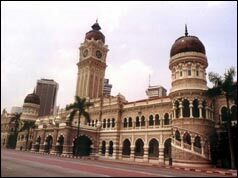 He was chosen from among the rulers of Malay's nine hereditary states. He will hold the post of head of state for five years when his successor will be elected. The installation ceremony will be witnessed by the Duke and Duchess of Gloucester who are flying in to represent the Queen. Following Malaya's independence, Tunku Abdul Rahman introduced reforms that spread power among the sultans and rajas who had ruled over fiefdoms on the Malay peninsula for hundreds of years. But non-Malays were disappointed that political power remained largely in Malay hands. In 1963 Malaya joined with Sabah, Sarawak and Singapore under a new name, the Federation of Malaysia. Rivalry between the Tunku and Lee Kuan Yew, Prime Minister of Singapore, saw Singapore leave the federation in 1965. Since Singapore's population was predominantly Chinese, its departure tipped the balance back in favour of Malays and increased tension between the two communities. In 1969 there were riots in Kuala Lumpur and 2,000 mainly Chinese protesters were killed. A state of emergency was declared and a year later Abdul Rahman retired from office. In the late 1980s he re-emerged into public life to criticise the authoritarian leadership of Mahathir Mohamad.